Flat chain feeding is the most efficient and effective way to distribute feed to commercial layers or breeders. The VDL chain feeding systems, with the famous VDL feed transport chain are made of high quality, durable material, the modular system makes the system suitable for any type of poultry house. 50 years of experience make the VDL Agrotech chain feeding system the most reliable, userfriendly and maintenance free chain feeding system on the market. A feed transport chain constantly mixes the feed ingredients, stimulates feed intake and prevents selective eating. 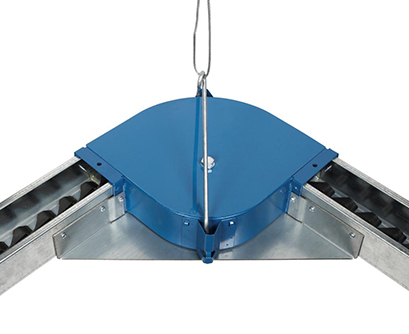 The chain feeding systems are available both supported and suspended, the robust winching systems make the suspended chain feeder and attractive option. 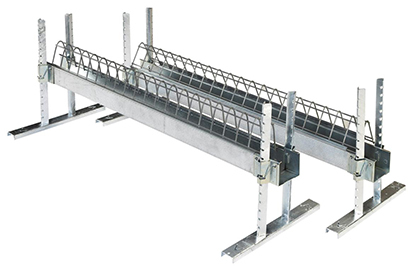 A typical system consists of troughs, grills or perch pipe, feed chain, corners, hoppers and drive units. Due to the modular design almost any layout is possible.